Difference between revisions of "Vineland Mennonite Brethren Church (Vineland, Ontario, Canada)"
The Vineland Mennonite Brethren congregation at [[Vineland (Ontario, Canada)|Vineland]], Ontario began services in 1927, and formally organized on 20 November 1932 under the leadership of D. Klassen. The first building was occupied in 1937, with a subsequent building program in 1960. The first meeting place was a rented implement shed where services were held with members of the [[Vineland United Mennonite Church (Vineland, Ontario, Canada)|United Mennonite Church]]. Later the building was bought by the congregation and converted into an attractive church building, with a tabernacle-like appearance. The congregation originated through immigration from the [[Union of Soviet Socialist Republics|Soviet Union]] and from [[Alberta (Canada)|Alberta]]. <em class="gameo_bibliography">Mennonite Brethren Herald </em>(27 May 1988): 52; (February 2012): 21. Vineland Mennonite Brethren Church, 1949. 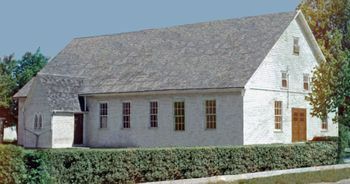 The Vineland Mennonite Brethren congregation at Vineland, Ontario began services in 1927, and formally organized on 20 November 1932 under the leadership of D. Klassen. The first building was occupied in 1937, with a subsequent building program in 1960. The first meeting place was a rented implement shed where services were held with members of the United Mennonite Church. Later the building was bought by the congregation and converted into an attractive church building, with a tabernacle-like appearance. The congregation originated through immigration from the Soviet Union and from Alberta. On 8 January 2012 the congregation celebrated 80 years of ministry in Vineland. The church concluded its independent ministry and became one of several sites of Southridge Community Church. Canadian Mennonite (15 April 1960): 1. Fortieth Anniversary: Mennonite Brethren Church, Vineland, Ontario. 1972, 20 pp. From His Fullness: a Brief Survey of the History of the Vineland Mennonite Brethren Church. Vineland, ON: Vineland Mennonite Brethren Church, 1962, 44 pp. History of the Vineland MB Church 1932-1982, Centre for Mennonite Brethren Studies. Mennonite Reporter (27 November 1972): 14. Mennonite Brethren Herald (27 May 1988): 52; (February 2012): 21. Janzen, H. H., Marlene Epp and Richard D. Thiessen. "Vineland Mennonite Brethren Church (Vineland, Ontario, Canada)." Global Anabaptist Mennonite Encyclopedia Online. December 2013. Web. 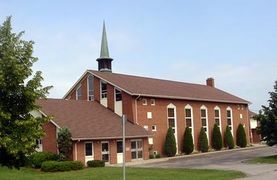 22 Apr 2019. http://gameo.org/index.php?title=Vineland_Mennonite_Brethren_Church_(Vineland,_Ontario,_Canada)&oldid=131153. Janzen, H. H., Marlene Epp and Richard D. Thiessen. (December 2013). Vineland Mennonite Brethren Church (Vineland, Ontario, Canada). Global Anabaptist Mennonite Encyclopedia Online. Retrieved 22 April 2019, from http://gameo.org/index.php?title=Vineland_Mennonite_Brethren_Church_(Vineland,_Ontario,_Canada)&oldid=131153.